The Rock of Cashel is a fourth-century fortified limestone height in the Golden Vale, Tipperary. Cashel was the ecclesiastical capital of Ireland and seat of the ancient Kings of Munster until Brian Boru, High King of Ireland, came to power. In 1101 the Rock was handed over to the Church by Murtogh O'Brien. 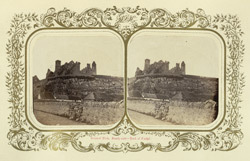 William Hempel describes the image, "This view, taken from the road leading to the entrance, is familiar to every visitor, and shows the general disposition of the buildings between the round tower on the right and the square tower of Cormac's Chapel on the left."